The Certificates in General Education for Adults, the CGEA, is an accredited adult literacy and numeracy course. The course consists of four streams - Reading and Writing, Oral Communication, Numeracy and Mathematics - at four levels. There are between three and eight Learning Outcomes for each stream at each level. The activities are based around practical, concrete real-life situations. 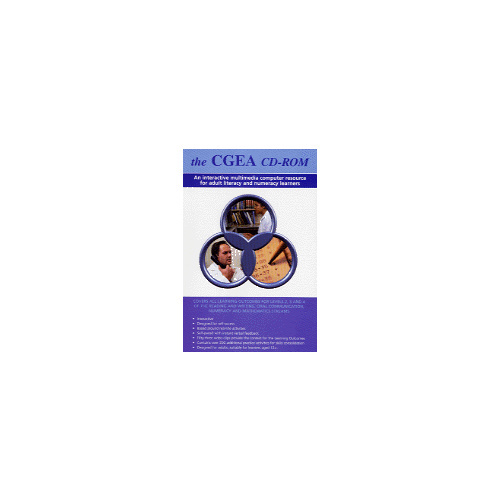 Features of the CGEA CD-ROM program: - self paced - fifty-three video clips provide the contexts for the Learning Outcomes - the program provides the learner with context-specific help - the instructions assist the learner by providing extensive verbal support and explanations - the feedback praises learners when they are right and provides context-specific explanations when they make a mistake. - Learners can print summaries of the steps involved for each Learning Outcome - There are over 200 additional practice activities to help learners consolidate the skills acquired.